Book direct from the owner! Welcome to our new furnished 1800 square ft. three bedroom, three and one-half bath room Townhome in beautiful Vista Cay resort. This three levels townhome is professionally decorated and focusing on the comfort of the guests, and give you a lot of space and privacy. It can sleep up to 8 guests. Two of the 3 bedroom are master suites (one King size bed, one Queen size bed) and the third bedroom has 2 full size beds. One master suite is located on the first floor and has French doors leading out to a patio. The other Master suite is located on the third floor and includes a walk-in closet. The third bedroom has two full size beds and is located across from the master suite on the third floor with generous spacing between the two for privacy. Each spacious bedroom has its own private decorated bathroom. All bedrooms include a new 32 inch Samsung LCD HDTV. A hair dryer is included in each bedroom. Ceiling fans were added to all bedrooms. The second floor has a large living & Dining area with a full size Kitchen. The large great room area leads to an 8-foot sliding glass door that opens to a balcony overlooking the patio below and a spacious grassy area. For your entertainment, the living room has a 52 inch LG LCD HDTV and a DVD player. The leather sofa converts to a queen-size bed for additional sleeping area if necessary. Hi-Definition cable services are included with access to 180 TV channels and high speed cable wired and WiFi internet throughout the house. Enjoy free calls within US and to Canada. There is a full size kitchen with granite counter-tops, cherry cabinets, and a large refrigerator, stove-top cooker, microwave, dishwasher, toaster, coffee maker and a lot of pots and pans, cooking utensils, dishes, glasses and silverware so you should feel right at home. Our townhome is an ending unit with one car garage you will have extra space for parking and store your luggage or business displays. There is a full-size large loading washer and dryer, an ironing board and iron and all towels and linens as well as beach towels. Vista Cay resort is an upscale gated community boasting a state-of-the art 10,000 square foot clubhouse. The clubhouse features a movie theater, resort style swimming pool with multi-level deck space, hot-tub, children's pool and a basketball court all with a beautiful view of Lake Cay. Additional amenities include a video arcade, pool tables, fitness center, and an internet library. 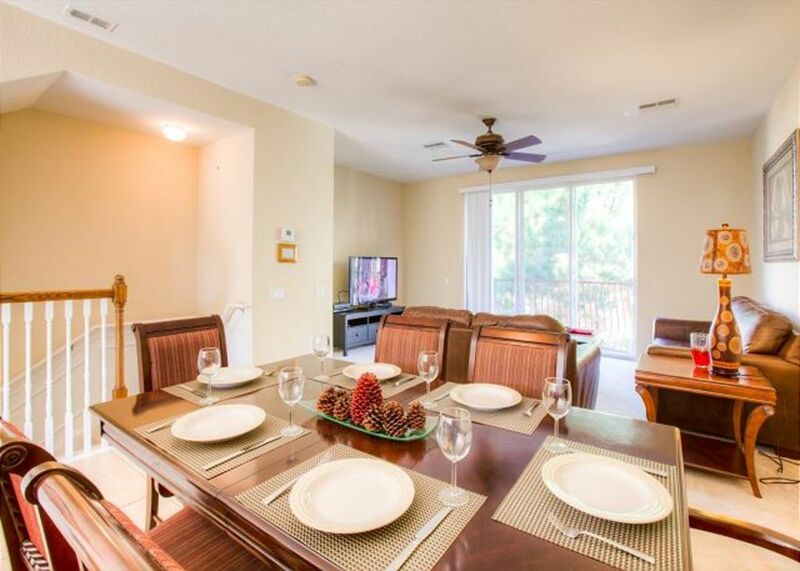 Book this beautiful House today for your group vacation, family gathering, business trip or corporate retreat please inquire about the other luxurious Townhome that we have at Vista Cay. Colleague and I stayed here while attending a recent conference. Nice location and clean. Seems to be a well-managed property. Very nice place, large floor plan, great value. Layout and location are great. The property is showing some signs of wear. Townhome was set up exactly as advertised. A little confusing at check in but the staff jumped in and helped us find out way. Perfect for attending a show at the convention center. Room enough for the six of us. Comfortable, clean and we all had our own space. It was a perfect fit for us. Quiet complex. Great pool area. And perfect distance to Universal. We loved this town house. It was clean, spacious, and served our needs perfectly. We stayed for ten days. We prepared most of our meals at the house. The only suggestion that I have is that they add a cutting board and a pizza slicer to their inventory!